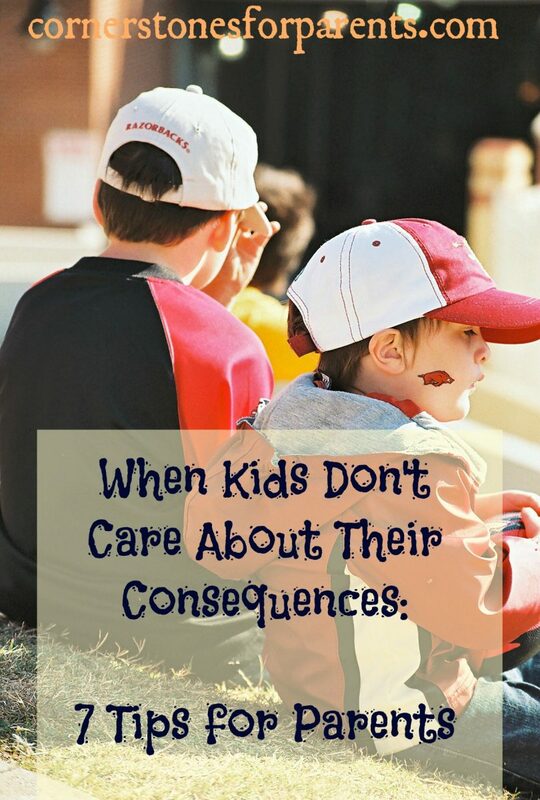 There is nothing more concerning (or infuriating) than when our children don’t care about the consequence we give them. There are a few different reasons why children might act this way. Here are a few questions you can ask yourself to get to the bottom of it all. 1. Is it a punishment or a consequence? Punishments seek to get back. Consequences help a child work toward something. Punishments help a child work OFF something. Consequences address the heart and future behavior. 2. Is the consequence too lenient? Maybe they don’t care because your consequence really isn’t a consequence at all. Threats are not consequences. Saying, “Keep it up and we’ll leave” isn’t a consequence. It is the threat of a consequence. Follow through is key. 3. Is the punishment too harsh? Out of anger we tend to dole out extreme punishments. Six weeks of no X-Box is a lifetime for your kids. There is a point of diminishing returns in parenting and economics. If you stretch it out too far, your intervention will lose its desired impact. And furthermore, if you hand out punishments like this, your children are not being trained in the process – they are just buying time until they get their beloved game back. 4. Does the consequence have an objective? What is the purpose of the consequence? Is it tied to the misbehavior or problem? What am I trying to teach my child with this consequence? Asking yourself these questions will help you determine if the consequence has a purpose or if you are just trying to “get back” at them for what they did. 5. Is my child too angry to care? If tempers are running high and you have just doled out a consequence, you might get an “I don’t care!” in response. Don’t let that deter you (or add to it in an attempt to make them care). The anger will pass. Just stick with the consequence (making sure it is a consequence and not a punishment) and make sure that anger doesn’t rub off on you. 6. Is the consequence in their “currency”? It comes as no surprise that kids are different. One child may love video games; another could care less about them. You have to make sure that the consequence you set forth is working for you and not against you. If you hastily apply consequences, take a moment to think about what you are doing and who you are dealing with. 7. Are they just covering up the fact that they care . . . a lot? Some kids act like they don’t care, but underneath they really do. Remember, if they act like they don’t care, it really isn’t your problem. If you have set up a consequence rather than a punishment as the result of the misbehavior, they will eventually have to get with the program in order to work towards what they are missing out on. If you have carefully selected your consequence, they will get on board. It will only be a matter of time.